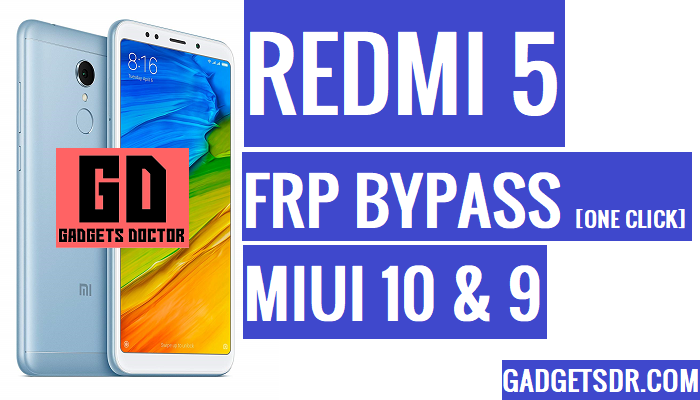 If you own a Redmi 5, and after the hard reset if you stuck at google account verification screen then here we show you One Click Bypass FRP Redmi 5 very easily, there is a couple of methods to unlock FRP from your device but we share here the latest and easiest method to One Click Unlock FRP Redmi 5, This phone has some strong features, The front camera of this phone is good enough to provide crisp and clear selfies and the storage of this device is sufficient enough to store a big amount of images, videos and kinds of music, Redmi 5 has decent processor and RAM management is very good while you do multitasking with this device. You can follow this method on any Redmi 5, Only you need a good internet connection and download some files To One Click Unlock FRP Redmi 5. Note:- This method is successfully applied to Redmi 5. First of all download all the below file that you need to One Click Bypass FRP Redmi 5. -Download first prog emmc File:- (Download Agent) file that helps you to detect your device in QUL Tool. -Redmi 6 Pro frp Tool:- It’s a new tool for remove frp. -Download & Install Qualcomm USB Driver. -First of all, download all the files first. -Then put your device in EDL mode. -Then Remove the back panel of your device. -Once done, remove all the screw with the screwdriver. -Now you will see your device motherboard, check the below image sort the two pins that we marked on below. -On your computer, right click on “My Computer” then go to “Manage” there select “Device Manager”. -There you will see “Port” click on the “Port” and there you will see “Qualcomm Comport USB Driver”. -Now you have successfully put your Redmi 5 into EDL Mode to One Click Bypass FRP REDMI 5A MC13B-MIUI 10. -Then click on the “Browse” button. -Once you click then a new popup will open, select the file from the”Redmi 5 FRP File” folder. -Now click on the “Port” button. -After that, you will see “Qualcomm comport” will show, that’s mean your device successfully connected. -Now click on the “Remove FRP” button. -Once done, then reboot your device, once rebooted you will see your device is successfully Unlock FRP Redmi 5. -I hope this method is fully worked with your Device. Thanks for visiting us, Comment below if you face any problem With This One Click Bypass FRP Redmi 5 Method, we will try to solve your problem as soon as possible. you can check other some tutorial here to help you.